Living in France for 30 years, the colours, textures and rhythms of the Mediterranean region shaped Sophie Verrechia and her work. When she moved to Australia, 15 years ago, the dry, wide-open spaces and the tropical rainforests added many layers of richness to her image making. Sophie’s influences are drawn from her past working experience as an illustrator, graphic designer and textile designer. “Often when I’m placing each small piece of glass next to another, I’m reminded of my embroidery making. It feels right”. 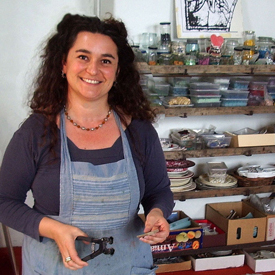 These days, Sophie finds most of her materials in op-shops, rubbish tips and recycling centres around the city and countryside. She salvages disused objects including second-hand ceramics which inspire her to reuse them in her own original mosaic creations. “Some people express themselves through watercolours, others through oils. My passion is ‘painting’ with tiles and other objects that I find along the way. Each piece of ceramic, glass or other material used represents my brush strokes, as if on canvas. The sense of movement obtained from blending tiny, irregular shards with larger more uniform shapes results in beautiful works of visual art. Just as a painter layers and combines his medium to create diverse surface effects, the use of an assorted range of textural materials gives my mosaic compositions a three dimensional life. My colour palette is unlimited. By blending tiles, ceramics, glass, pottery and unique ‘found’ objects, I can produce anything from subtle, delicate hues to bold, rich, obsessive colourings. I source an eclectic array of materials in tile shops, recycling centres and from the environment, both in Australia and internationally, when I travel. If I can’' find exactly what I want, I make my own ceramic tiles, painting and firing them to complete my design.